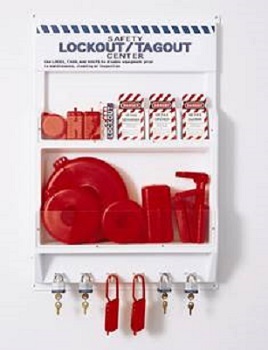 ​Employees who work with hazardous energy must be trained in energy control procedures, also known as Lockout/Tagout. Measures must be taken to disable machinery to prevent the release of hazardous energy during maintenance procedures. Is all machinery or equipment capable of movement required to be de-energized or disengaged and blocked or locked out during cleaning, servicing, adjusting or setting up operations? If the power disconnect for equipment does not also disconnect the electrical control circuit, are the appropriate electrical enclosures identified and is a means provided to ensure the control circuit can also be disconnected and locked out? Is the locking out of control circuits, instead of locking out main power disconnects, prohibited? Are employees instructed to always push the control circuit stop button prior to reenergizing the main power switch? Are a sufficient number of incident prevention signs or tags and safety padlocks provided for any reasonably forseeable repair emergency? When machine operations, configuration or size require an operator to leave the control station and part of the machine could move if accidentally activated, is the part required to be separately locked out or blocked? Want Free Safety Measurement Tools? When you sign up for the Journey to Safety Excellence, you gain access to online tools, including a Safety System Assessment that is helpful in pinpointing specific safety improvements needed.